Now that the traditional proxy season has ended, it’s time to take a look at this year’s results for the non-binding shareholder advisory vote on the compensation of a company’s named executive officers (the so-called “Say-on-Pay Vote”) required by Section 14A of the Securities Exchange Act of 1934 (as added by the Dodd-Frank Wall Street Reform and Consumer Protection Act). 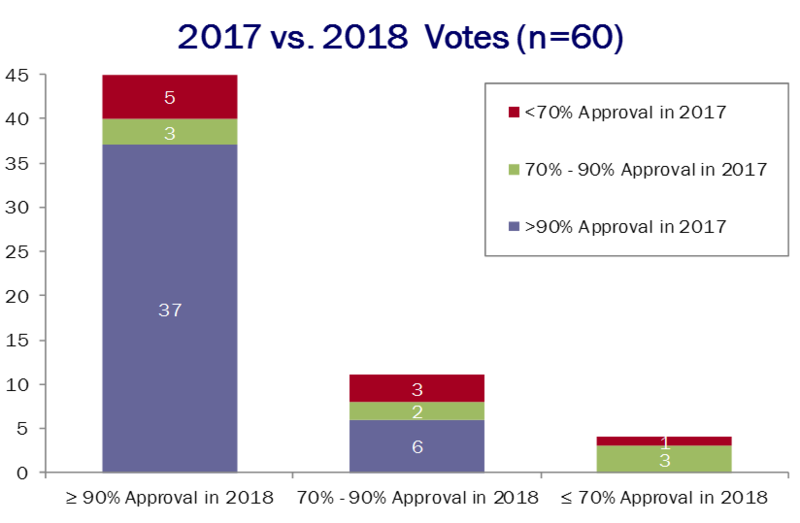 So far, 2018 has been notable for the continuing high number of companies that have received over 90% support for their say-on-Pay proposal (71 %) and the fact that three companies have failed the vote this year. This Thoughtful Pay Alert summarizes our findings as of June 30, 2018, based on the results of their 2018 annual meeting of shareholders as disclosed by the Bay Area Tech 120 companies. These results are reflected in the Exchange Act reports of these companies as filed with the Securities and Exchange Commission. We intend to update this report at the end of the year to report our findings for annual meetings of shareholders conducted this fall. Support for executive compensation programs continues to be favorable. Nearly all (95.2%) of the Bay Area Tech 120 companies that have held their 2018 Annual Meeting of Shareholders as of the middle of the year have seen their shareholders approve the compensation of their named executive officers. To date, only three companies have recorded a failed Say-on-Pay Vote. Level of support is consistent with prior years’ support levels. The average level of support among the Bay Area Tech 120 companies that have held their 2018 Annual Meeting of Shareholders has been 87.6% (compared to 90.5% support in the Russell 3000). Similarly, shareholder support for the Bay Area Tech 120 companies that have held their eighth Say-on-Pay vote this year has been slightly higher, coming in at 90.1%. Dramatic Vote Fluctuations Continue to be Possible. Even with the relative year-over-year stability seen from most companies, shareholder support for a Say-on-Pay proposal can change almost overnight. To date, five Bay Area Tech 120 companies that received more than 85% support in 2017 saw this support drop by at least 30% in 2018. 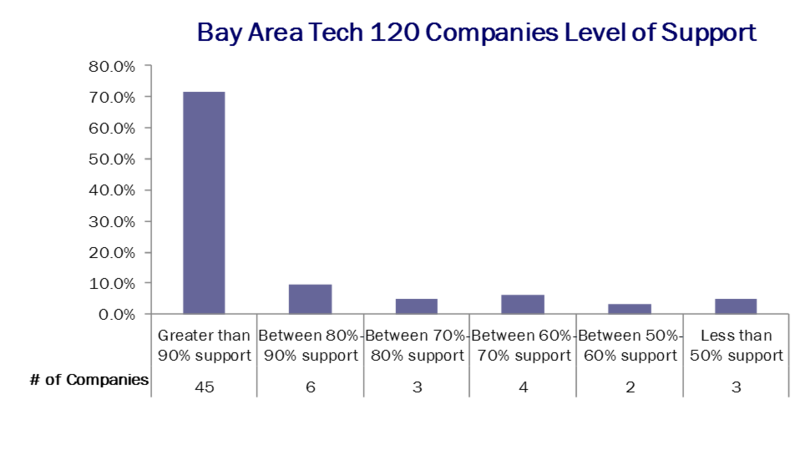 Similarly, three Bay Area Tech 120 companies that received less than 75% support in 2017 saw support increase by an average of just under 24% in 2018. Overall, the average level of support for the 63 Bay Area Tech 120 companies conducting Say-on-Pay Votes so far in 2018 has been 87.6%. In the case of the 38 companies which held their eighth Say-on-Pay Vote in 2018, average support was nearly 90.1%, compared to 92.6% average support for the same group of companies in 2017, 89.3% average support in 2016, 87.8% average support in 2015, 90.4% average support in 2014, 84.3% average support in 2013, 88.0% average support in 2012, and 88.5% average support in 2011 – a relatively consistent result (with a slight (almost 6%) dip in 2013). 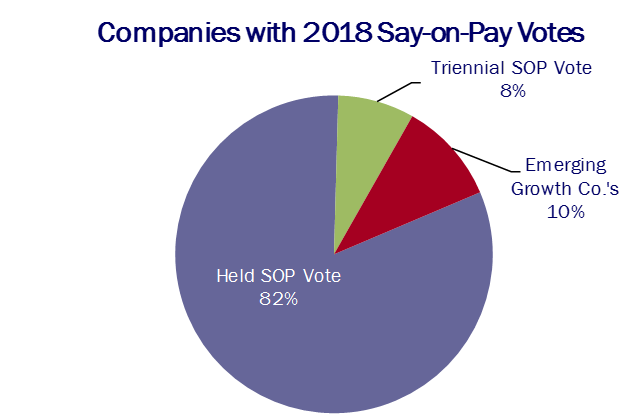 While the decided majority of companies continue to receive strong support for the compensation of their named executive officers in 2018, it is notable that 26 of these companies received 95% or more support from their shareholders, including four companies that received near unanimous approval of their executive compensation program with 99% or more of the votes cast on the Say-on-Pay proposal voted in favor of the proposal. To date, three of the Bay Area Tech 120 companies, Qualys, Rambus, and Sanmina, have failed to receive a majority of the votes cast in favor of their Say-on-Pay proposal. At Qualys, 38.8% of the votes cast supported the company’s named executive officer compensation, while 61.2% of the votes were cast against (or abstained on) the proposal. This follows a vote of 96.1% for the proposal and 3.9% against (or abstained on) the proposal in 2017 – a swing of 57.3% of the votes cast on the Say-on-Pay Vote. In the case of Rambus, 46.0% of the votes cast supported the company’s named executive officer compensation, while 54.0% of the votes were cast against (or abstained on) the proposal. In 2017, only 77.0% of the votes cast on the company’s Say-on-Pay proposal supported the compensation of its named executive officers. Finally, at Sanmina, only 30.7% of the votes cast on the company’s Say-on-Pay proposal were voted in favor of the compensation of its named executive officers, with nearly 70% (69.3%) of the votes cast on the proposal voted against their compensation. In 2017, the company received almost 76% support for its named executive officer compensation (75.9%). Of the 38 companies that have now held eight votes, 13 received more support (an average of 6.9%, with a median increase of 1.9%) in 2018 compared to 2017, while 25 saw support for their executive compensation program decline (by an average of 7.5% , with a median decrease of 1.8%). As has been the case each year, a handful of companies have experienced a significant vote swing on their Say-on-Pay proposal between 2017 and 2018. So far, three companies have seen support for their executive compensation program increase by over 20% in a single year, while eight companies have seen their support drop by over 20% in a single year (including six companies where support declined by over 30% and one company where support dropped by over 55%). Interestingly, two of the four companies that received less than 70% support in 2017 which have held their annual meetings experienced a significant increase in support in 2018; typically, by an average of nearly 26%. For example, Imperva, which failed the Say-on-Pay Vote in 2017, improved the support for its named executive officer compensation from 57.1% to 87.4% in 2018 – an increase of over 30%. As in prior years, a number of the Bay Area Tech 120 companies (33) that received more than 90% support in 2017 saw support for their executive compensation program decline in 2018. The average amount of this decline (8.1%) was largely influenced by the fact that one company experienced a decrease in excess of 57% while two other companies recorded decreases of approximately 40%. Just as notable, 12 of the Bay Area Tech 120 companies that received 90% or more support in 2017 actually saw this support increase in 2018 (by an average of 1.0%) – a truly remarkable result given the limited amount of room to garner additional votes in favor of their executive compensation program. Further, of the companies that saw support for their Say-on-Pay proposal decrease in 2018, the decline for 18 of these companies was 2.0% or less. As in prior years, the experience of the Bay Area Tech 120 companies with the Say-on-Pay Vote continues to be consistent with past experience. 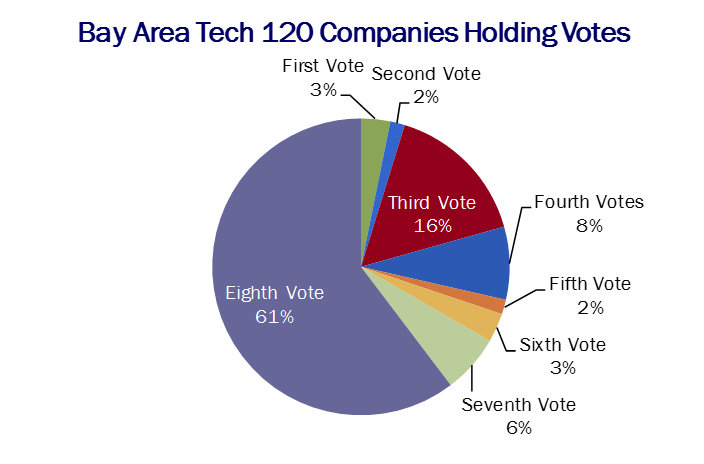 As in the preceding seven years, for most of the Bay Area Tech 120 companies that already have held their annual meeting of shareholders, the vote was largely a non-event. Further, for the companies that have now held eight Say-on-Pay Votes, support for their executive compensation program has (with just a few exceptions) largely remained strong year-over–year, as reflected by their average annual support at or above the 90th percentile. It also continues to the case that, as long as a technology company’s financial performance (as measured by total shareholder return) is in the top half of its industry sector, and absent a specific problematic compensation decision or policy, it should not encounter any significant issues in obtaining majority support for its executive compensation program. Of course, maintaining an effective shareholder engagement program has now become an integral part of this process. It also remains to be seen whether changes to Institutional Shareholder Services’ “pay-for-performance” methodology (which, under certain circumstances, will assess a company’s performance using financial metrics other than TSR) will have an effect on Say-on-Pay outcomes. By identifying and addressing potential concerns well in advance, technology companies should be able to avoid problems and ensure a favorable outcome for their Say-on-Pay Vote. Compensia has extensive experience in helping companies draft the executive compensation disclosure in the proxy materials for their annual meetings of shareholders and analyze the potential impact on the shareholder advisory vote on named executive officer compensation. If you would like assistance in preparing your executive compensation disclosure for your Say-on-Pay Vote, or if you have any questions on the subjects addressed in this Thoughtful Pay Alert, please feel free to contact Mark A. Borges.